St. Martin's Griffin, 9781250016324, 192pp. Calligraphy is about creating something uniquely beautiful, whether to celebrate a special occasion like marriage or to use every day in the form of stationery. 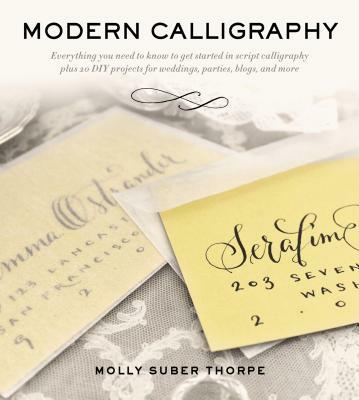 Author Molly Suber Thorpe, an award-winning designer and calligrapher based in Los Angeles, works closely with her international clients to give them the distinctive products they're looking for. Now you can learn from this experienced expert how to master this fresh modern lettering style. The first book to teach this bold new style breaks the calligraphy process down into simple steps so anyone can learn to create their own stunning wedding invitations, thank you cards, gift tags, and more. Starting with an overview of the supplies—from paper to ink to pens—you will learn how to form letters, words, and then phrases by following Molly's clear step-by-step instructions, and by practicing with the provided templates. After mastering letter forms using a pointed pen and ink you can take it to the next level by learning how to use watercolor and gouache, or how to digitize your calligraphy. The twenty projects in the book provide lots of inspiration for making your own and are grouped into three sections: weddings, entertainment, and personal stationery. With loads of ideas, practice exercises, and helpful tips, soon you will be turning out gorgeous script calligraphy pieces like the ones featured in wedding magazines and popular websites like Pinterest. MOLLY SUBER THORPE is a hand lettering artist whose focus is on branding and editorial calligraphy work. She is credited as a driving force behind the modern calligraphy movement, being among the first artists to use the whimsical, unorthodox pointed pen styles and bold color palettes so popular today. Clients hire Molly for a variety of projects, including hand-lettered logos, envelope calligraphy, custom stationery, and even tattoos. Modern Calligraphy: Everything You Need to Know to Get Started in Script Calligraphy (St. Martin’s Griffin, 2013), has been translated into Chinese and Spanish, and was named one of 2013’s “Favorite Craft Books” by Amazon. Molly's second book, The Calligrapher’s Business Handbook: Pricing and Policies for Lettering Artists (Calligrafile Press, 2017), guides hand letterers to develop a thriving freelance career, and has been an Amazon Bestseller in the Calligraphy and Business of Art categories. Molly’s extensive client list includes Google Arts & Culture, Martha Stewart Weddings, Michael Kors, Fendi, AARP, J. Jill, and Victorio & Lucchino. Her work and words have appeared in dozens of publications, including UPPERCASE, Martha Stewart Living, The Wall Street Journal, LA Times, The Guardian, Buzzfeed, Bound & Lettered, Country Living, Style Me Pretty, Design*Sponge, and Snippet & Ink. Molly also loves to teach. In addition to conducting in-person calligraphy workshops in the United States and Europe, Molly is a Top Teacher on the Skillshare.com platform, with over half a million minutes of watch time since her first Skillshare class launched in 2013. In 2016, Molly founded Calligrafile.com, a curated database of resource links and products for calligraphers, hand lettering artists, type enthusiasts, and creative freelancers. It is the largest site of its kind, with over two dozen contributing artists, and thousands of participants from around the world.